The biggest source of energy on this earth, now or ever, is solar. I used to think it was so diffuse as to be impractical. But I?? ?ve changed my mind. It?? ?s not impractical?? ?This technology exists right now. So if we just convert the technology and research and facilities of the oil and gas industries, the chemical industry and the electrical power industry?? ?we could do it tomorrow. All we?? ?ve got to do is throw our weight into it. Both Stuart Staniford’s recent “Powering Civilization to 2050” post and (to a lesser extent) Scientific American’s “Solar Grand Plan” concentrated on using photovoltaic solar cells to provide the bulk of our energy needs. While both thin film and traditional silicon based PV cells seem to set new efficiency records every couple of months (a CIGS cell recently reached 19.9% efficiency in lab tests, and multi-crystalline silicon PV cells recently reached 19.5% efficiency), the most promising mechanism for large scale solar power generation seems to be solar thermal power (often referred to as concentrating solar power, or CSP). While this subject has been covered previously at TOD (from a slightly UK-centric viewpoint), I thought it was worth revisiting as solar thermal power has received a lot of press attention lately, as experience with generating power in this way grows and the potential becomes clearer to a larger number of parties. Concentrated sunlight has been used to perform useful tasks for many centuries. A legend claims Archimedes used polished shields to concentrate sunlight on a Roman fleet to repel them from Syracuse in 212 BC. Leonardo Da Vinci considered using large scale solar concentrators to weld copper in the 15th century. Auguste Mouchout successfully powered a steam engine with sunlight in 1866 – the first known example of a concentrating solar-powered mechanical device. Concentrating Solar Power (CSP) systems use lenses or mirrors combined with tracking systems to focus sunlight which is then used to generate electricity. The primary mechanisms for concentrating sunlight are the parabolic trough, the solar power tower (not to be confused with solar updraft towers) and the parabolic dish. The high temperatures produced by CSP systems can also be used to provide heat and steam for a variety of applications (cogeneration). CSP technologies require direct sunlight (insolation) to function and are of limited use in locations with significant cloud cover. 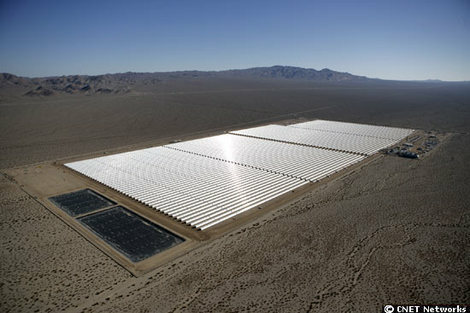 Solar thermal power plants have been in commercial use in southern California since 1985. An area of desert around 250 km by 250 km covered with CSP power generation could supply all the world’s current electricity demand. Solar thermal plants can be built in their entirety within a few years – much faster than many conventional power projects. Solar thermal plants are built almost entirely with modular, commodity materials (and thus have short development and construction times) and do not encounter the sort of opposition on environmental grounds that traditional forms of power generation like coal and nuclear face. There has been a spate of new announcements regarding solar thermal power over the past year – there are over 5,800 MW of solar thermal plants in the planning stages worldwide. The company receiving the most attention seems to be Ausra, a company set up by Dr David Mills (who pioneered the CSP plant at the Liddell power plant in New South Wales using compact linear Fresnel-reflector technology) with backing from Vinod Khosla and Kleiner, Perkins, Caulfield & Byers (see here for a brief demo of how their technology works). Mills estimates that solar thermal plants could provide more than 90 percent of current U.S. power demand at prices competitive with coal and natural gas. “There’s almost no limit to how much you can put into the grid,” he says. Mills presented a paper (pdf) at the IEA SolarPACES conference in Las Vegas recently which revealed some interesting statistics about the construction cost of solar-thermal technologies: US$3,000 per kW of capacity, estimating this will drop to US$1,500 per kW over the next “several” years. The New York Times last year quoted GE Energy executives estimating coal plant construction between US$2,000 and US$3,000 per kW. Ausra says it can generate electricity for 10 cents per kWh (close to the current cost using natural gas), and it expects the price to drop even further. Ausra is initially planning a 177 MW plant in California, and has committed to supply 1,500 MW of power to Californian utilities PG&E and FPL. They are also rumoured to be moving in to Texas as well. PG&E have also signed a 25-year deal with Ausra competitor Solel Solar Systems of Israel to buy power from a 553 MW solar thermal plant that Solel is developing in California’s Mojave Desert. 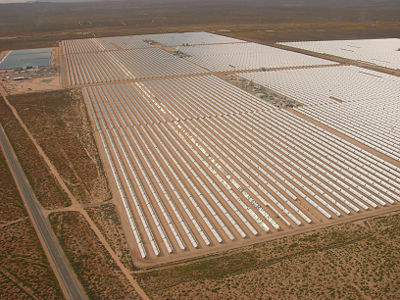 FPL has also hired Solel to upgrade the SEGS solar-thermal plants it operates in the Mojave. Another PG&E contract is with BrightSource to supply between 500 MW and 900 MW of power per year from solar tower plants in California, beginning in 2011, with the first of a number of 100 MW facilities being built in Ivanpah. Other companies active in the US include eSolar (linked to Google’s energy initiatives), RocketDyne and SkyFuel. Abu Dhabi’s Masdar Initiative and Spain’s Sener are have formed a joint venture to build and operate concentrating solar power plants across the world’s sunbelt regions called Torresol Energy. 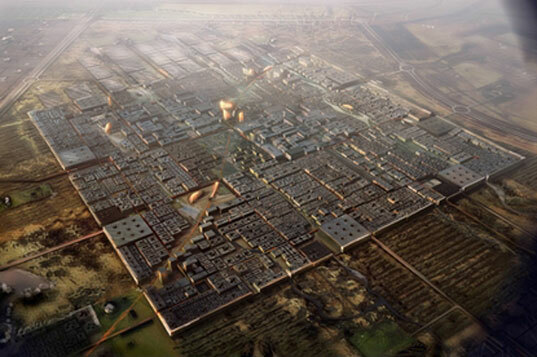 Independently of Torresol, Masdar is developing its 100 MW “Shams 1” CSP plant in Abu Dhabi. 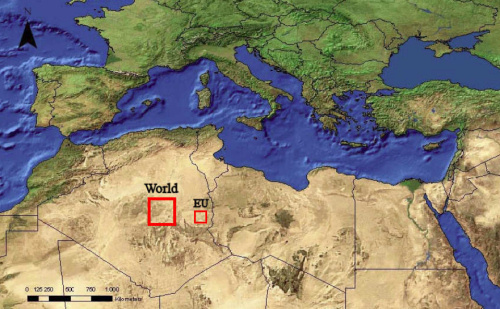 Algeria and Germany have signed a a joint research agreement for the development of a new generation of large-scale, low-cost solar thermal power plants (which could contribute to the Desert-TREC vision of large scale CSP in North Africa powering Europe). Feasibility studies are also being done in Oman, China and Mexico. One of the key differentiating factors between solar thermal power and solar PV is that heat energy is more easily (and efficiently) stored than electricity, with solar thermal plants often combining energy storage into the design to enable around-the-clock, dispatchable electricity generation. Most solar thermal plants are looking to use molten salt for storing energy – other alternatives being developed are graphite (in the Cloncurry development), heated water / steam (for the Ausra plants) and heat-transfer oil such as therminol (for the Abengoa plant in Arizona). The existing plants prove that concentrated solar power is practical, but costs must decrease. Electricity from solar thermal plants currently costs between US$0.13 per kilowatt hour (kWh) and US$0.17 per kWh, depending on the location of the plant and the amount of sunshine it receives. Conventional power plants generate electricity for between US$0.05 and US$0.15 per kilowatt hour (not including any carbon taxes or cap and trade related costs) but in most places it’s below US$0.10 (wind power generally costs around US$0.08 per kWh). An economic analysis released last month by Severin Borenstein (pdf), director of the University of California’s Energy Institute, notes that solar thermal power will become cost competitive with other forms of power generation decades before photovoltaics will, even if greenhouse-gas emissions are not taxed aggressively. In 2006 a report by the Solar Task Force (pdf) of the Western Governors??? Association concluded that CSP could provide electricity at US$0.10 per kWh or less by 2015 if 4 GW of plants were constructed. According to Bernhard Milow from the German Aerospace Center (DLR) electricity from solar thermal plants could cost as little as ?? ?0.04 per kWh [US $0.06/kWh] by 2020, with well sited plants potentially generating power at lower prices than coal. The US DOE began supporting large scale CSP last year, aiming to reduce the cost of CSP power to 7-10? ?/kWh by 2015 and 5-7? ?/kWh by 2020. The DOE estimated that reaching these cost targets could lead to installation of up to 35,000 MW of new generating capacity by 2030 in the US. James Fraser at The Energy Blog commented at the time that it was 5 years too late (given recent commercial activity in the area) and that PV solar may beat these price goals before solar thermal does, but that more solar options are good in any case, as both PV and thin film solar manufacturing will be constrained by availability for materials for some time as production continues to accelerate. Another estimate from Sandia labs showed solar thermal costs (for solar towers) could fall to around 4 cents per kWh by 2030. 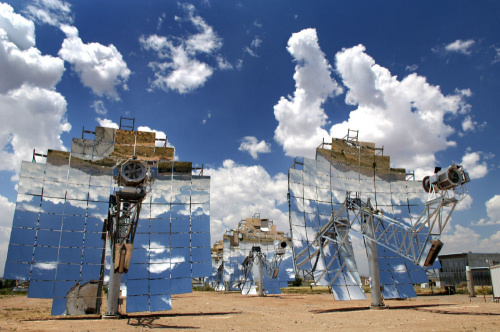 Another variant on the solar thermal power theme are Stirling engine based power plants, which generate electricity directly rather than first storing the energy as heat. Stirling Energy Systems seems to be the leader in this field, with some reports talking about agreements with Southern California Edison and San Diego Gas & Electric for up to 1.75 GW of power. The company recently set a new world record of 31.25% for Solar-to-Grid conversion efficiency. Other companies pursuing stirling engine based solutions are Infinia and SunPower (not to be confused with its larger namesake in the PV industry). Generating power isn’t the only way to utilise solar thermal energy of course – solar hot water is a very cheap and efficient way of replacing gas or electricity usage with solar energy. Solar hot water systems are in widespread use in Australia, with state and federal governments encouraging people to upgrade their home hot water systems to solar – almost cost free in some states. The New Zealand government is also encouraging the use of solar hot water systems. 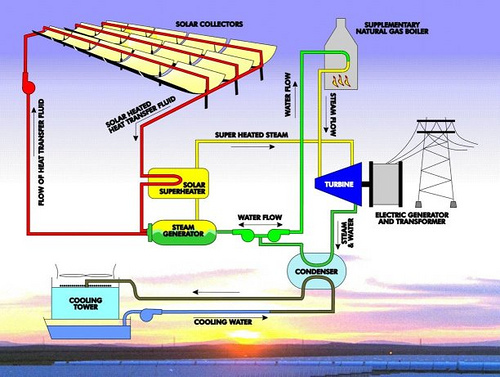 Some larger scale uses of solar thermal hot water are being put in place by Abengoa in Texas and Colorado. Solar hot water is in wide use in China as well, with the city of Rizhao becoming somewhat famous for achieving widespread takeup of the units. An unusual variation of the direct capture of solar energy in the form of heat is from a Dutch company that has developed a “Road Energy System” that siphons heat from roads and parking lots to heat offices and homes. And one final use of solar thermal power – it can keep your house warm, if your windows face the right way, and even better, have insulating glass that doesn’t let the heat out again – which could help make your building energy positive.